On Saturday 29th November I was the Speaker at the Wirral and West Cheshire Area Day. The village where the meeting was held is very special – it gets a mention in the Doomsday Book and received its name in the reign of Edward the Second (1284 – 1327) when a Thorneton married a Hoghe: but it’s personality really began to develop when Joeph Hirst, a Yorkshire mill-owner, decided to develop a small ‘model village’ there. 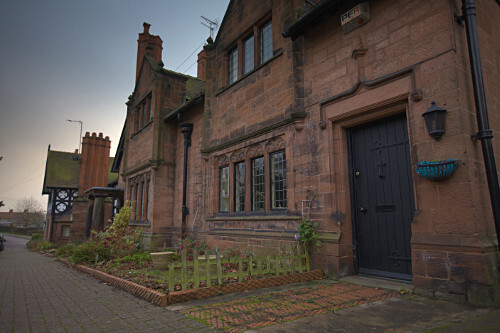 The work was continued by William Lever, of Port Sunlight fame, who developed the village to house family, estate workers and company staff. 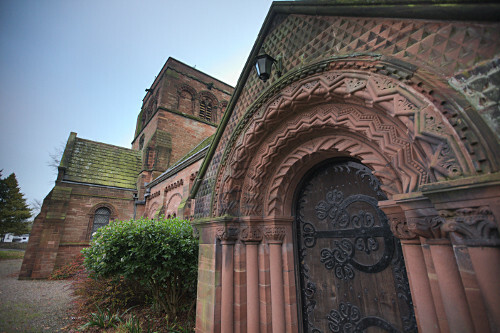 It is built on an Elizabethan theme with red stone and black and white half timbered houses which are built round a large village green. The hall used for the meeting was spacious with a separate ‘cafe’ area and was ideally suited to giving a talk in the morning and a mini-workshop in the afternoon. I had a lovely welcome from the group, led by Fiona, and the talk was warmly received, with lots of interesting questions at the end – what a lovely audience. Fiona gave Daf and I a really good lunch – thank you, Fiona. 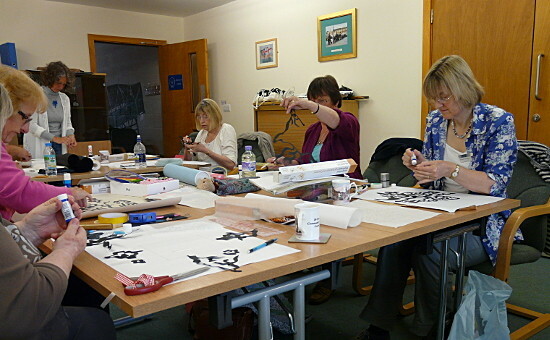 In the afternoon I taught ‘Folded Paper Applique’ – in which no paper is folded! 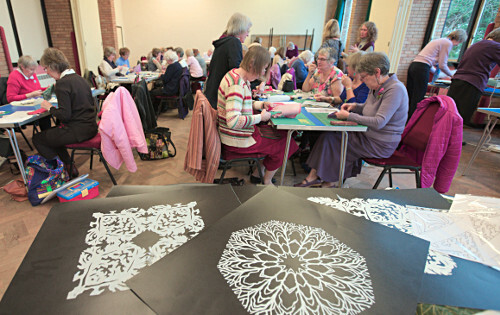 – a method I came up with based on the doilies or rows of figures holding hands I used to cut out of folded paper as a child: that was where the ‘folded paper’ bit of the title came from – see! 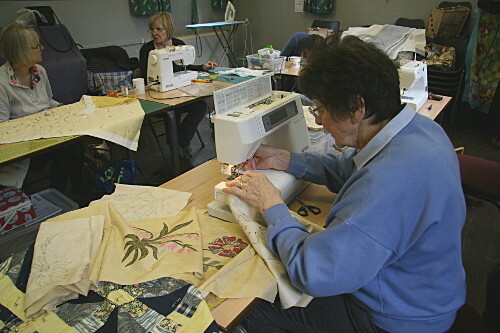 Everyone worked really conscientiously and by the end of the afternoon lots of pieces were fixed to their backing fabrics ready for layering and and quilting at home. I always love to see how everyone’s work develops its own personality through different colour/pattern combinations. A few people worked with the basic design at an ‘unintended angle’ (there’s no such thing as a mistake!) and the results were great: experiment, you never know what the results will be. I had a really enjoyable day and I hope everyone else did too. Thanks to you all and especially to Fiona for inviting me along. Good luck to the two ladies who are taking over from her. And thank you very much to Dot Sherlock for the Geckos! This entry was posted in Blog and tagged Folded paper Applique on 1 December, 2014 by admin. A lot has happened since my last blog. The 2013-14 Beginners’ and Intermediate/Advanced Courses have finished and I have taught my annual ‘One and Two Day Workshops’. 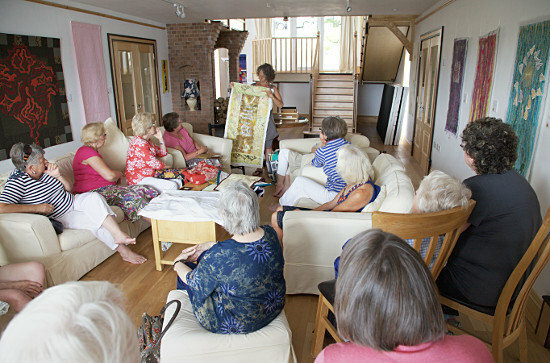 On top of this I have given talks and workshops to a number of quilt groups around the UK, which has been great fun – I have met some really lovely people, and been made most welcome. Quilters everywhere are special people and in 2015 I’m likely to prove this internationally, as I have invitations to teach in Doha, Qatar and Newfoundland in Canada. I can’t wait. Also, 2015 is an exciting prospect because I have a one-woman exhibition, from 25th April to 7th June, in Oriel Ynys Mon, the wonderful gallery in the heart of the Isle of Anglesey, which holds a major collection of work by Sir Kyffin Williams RA. 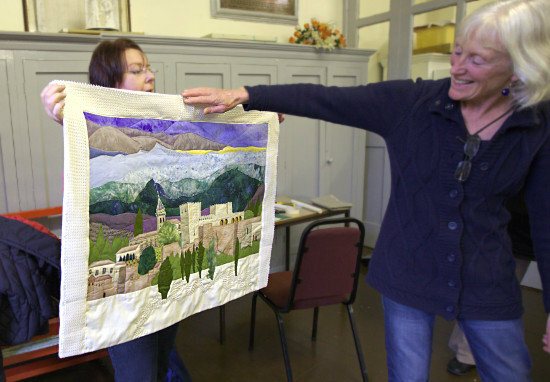 Meanwhile, a group of quilt artists, of which I am a member, Cwilt Cymru, have a travelling exhibition, ‘Connection’: it will next appear at Minerva, in Llanidloes, featured in their annual ‘Summer Exhibition’. We have a ‘Meet the Artists’ day on Sunday 20th July from 11:00-15:00 where a few of us (including me) will be demonstrating. I’d love to meet you if you’re in the area. Back at home at Coed y Berclas, our self-catering Cottage and Apartment are keeping me on my toes, but I managed to enjoyed a relaxed ‘Mad Quilters’ Tea Party’ with some of my very special quilters: it’s lovely to chat over a cup of tea and homemade ‘munchies’ then see how some of the work they have started with me has developed. I really enjoy these occasions. Now I need to get out and begin recruiting new ‘beginners’, so, if you think you might be interested, give me a call or send an email – I’m really very friendly! This entry was posted in Blog on 28 June, 2014 by admin. I have finished two pieces of work, ‘We Stand Surrounded by the Work of Thieves’ and ‘Autumn – A Dirge’, as well as their handling samples and Artist’s Statements, all before Christmas – it’s good to have a deadline! They will form part of a travelling exhibition, ‘Connection’ by a group I belong to called Cwilt Cymru. Leafing through a book of poetry by Percy Bysshe Shelley, I discovered one poem written in 1820, which appealed to me: it began to conjure up images in my head as I read it. For me the darkness of this poem, relating to the end of the year, is strangely comforting. The imagery is tragic and melancholy but beautiful and I was inspired to take the opening lines and incorporate them into my hanging. I have used colours and imagery suggested both by the poem and my own observations of the changing seasons. I have also incorporated crows because of their dark associations, and because we have crows, jackdaws and ravens living on our land, and their calls, and something about their visual aspect somehow feel appropriate to this season and this piece of work. The hanging is in three sections: the wholecloth centre is painted, printed, stencilled, and machine quilted with appliquéd letters. It is divided from the first border by couched threads. This border is created in a similar way but the colours are lighter and less intense and I have used a simplified lithographic process to print the birds on the upper and lower sections. The final border is a commercial fabric which is machine quilted, with the addition of two skeletal leaves which unite the two borders. Cotton fabric, cotton, silk and metallic threads, painted transfer adhesive lettering, lithography, machine quilting, appliqué leaves. I was naïve enough to be horrified by the greed and corruption exposed during the financial ‘crash’ within the banking sector. What makes it worse is that although massive sections of society have suffered because of the banking crisis, the people at the centre seem to be undisturbed as though at the ‘eye of the storm’, still wealthy, still greedy and still in control. Greed and corruption, of course, are not only evident in one sector of society, and stung by these thoughts and feeling impotent in the face of them, I set about responding through my work. The work is blue and understated, hiding its serpentine message in intertwining words which are subtle and need to be searched for in the same way that the manoeuvrings of the powerful are disguised and secretive. 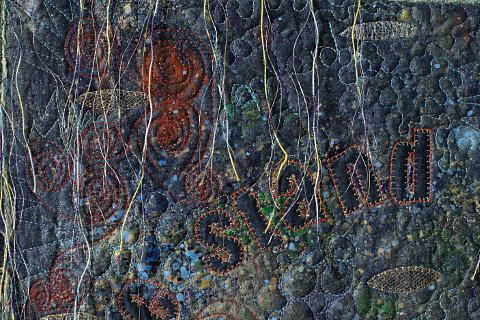 There are also words which appear in the background machine quilting, though many are difficult to decipher or simply illegible. Falling through the image are appliqué silver discs suggestive of coins. There are flashes of red in the painted/printed background and around the lettering. Red is used to symbolise danger or threat. The border is foundation pieced but with no apparent pattern or regimentation and separating it from the centre is a confusion of couched threads, distracting the eye from the message within. Cotton fabric with used with small amounts of metallic net, cotton, silk and metallic threads. 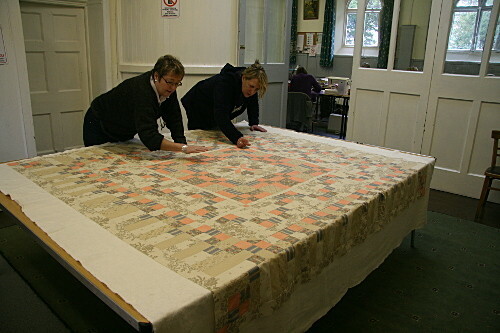 The wholecloth centre was painted, stencilled, printed, appliquéd, couched and machine quilted. The border was pieced, machine quilted and couched. 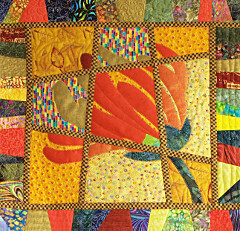 This entry was posted in Blog and tagged Art Quilt on 3 January, 2014 by admin. Thursday 12th was the last class before Christmas for my Intermediate/Advanced class, so, in time honoured fashion, everyone who could make it brought a contribution to the midday meal. It’s a pleasant way to end the term and we took the opportunity to toast ‘the New Year, sewing and ourselves!’ (in apple/raspberry juice and carbonated water since we were all driving home). I have an apology too – Sally, I can’t believe we allowed you to take your beautiful ‘coffee cake’ home without even tasting it! We were supposed to have it with our cuppa in the afternoon, but everyone was too busy to stop for a drink: we missed out! This year is mostly about finishing off work which otherwise was beginning to pile up for everyone. It can be dispiriting to have too many pieces ‘on the go’ and be faced with yet another project before anything is completed, so this year is dedicated to reducing the pile of UFOs (unfinished objects). Next September I won’t be so lenient – we will be working on ‘Textures’, using lots of different techniques, some traditional and some contemporary/experimental. I hope everyone will find something to suit them and which they will want to take further. 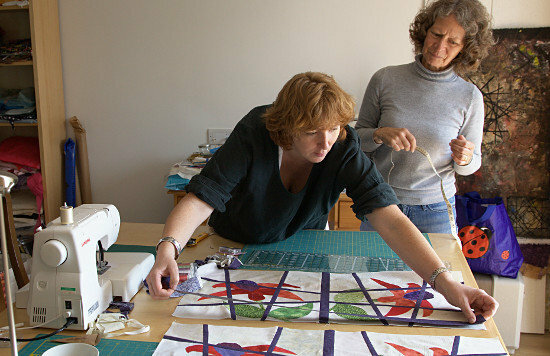 In two of the photos you can see bed quilts made by Karen and Sally: they are both working from the same basic layout, but, as you can see, their pieces are totally different. Karen has made a fresh Spring-like quilt top by choosing gentle, light colours and has used fairly traditional piecing methods. 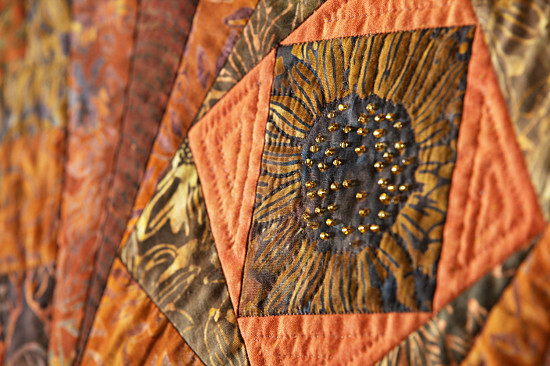 The focal areas on Sally’s quilt are foundation pieced and she has really pushed the technique to dramatic affect. It is always a delight to me to see where people take an idea, putting their own personal stamp on what they create. 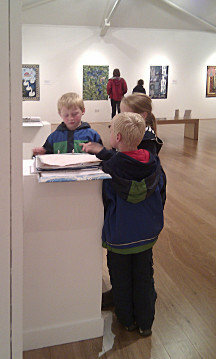 It’s also great for the group to see each other’s work and share ideas. Despite the fact that this was the end of term, everyone was determined to get on with their work but the question is – will anyone manage to get any further on despite the demands of the Christmas break? Merry Christmas and a Happy New Year to everyone – keep sewing!. This entry was posted in Blog on 15 December, 2013 by admin. 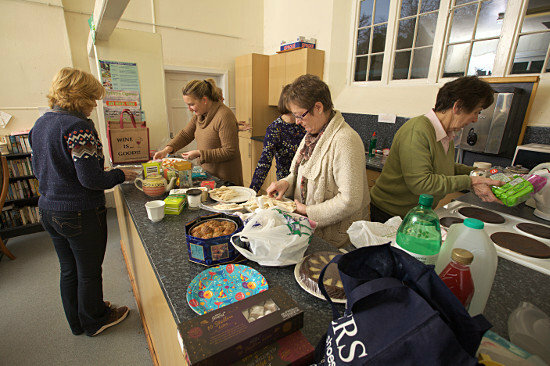 As Christmas approaches, we finish the term with a Pot Luck Lunch, at the last class. To make the day really exciting, my Beginners are at the stage of putting their quilt tops together and they are looking gorgeous (quilt tops and quilters!). I always love this session and the current group are just brilliant. Being a teacher is a real privilege, I love watching people developing skills and understanding, then pushing the boundaries: that’s the best bit, when students stretch their wings and fly off in their own artistic directions. Just look at the beautiful array of colours and shapes in the Beginners’ quilts this year. I know some of them have surprised themselves with what they have achieved and there are still plenty of stages left, layering, quilting, binding – each brings a new skill and more joy. I love all the quilts, but Paula’s boats, drawn for her by her daughter Imogen, and Anita’s cockerel have drawn a lot of interest in the group – and you can see why. Christmas is great fun (usually!) but I’m looking forward to the new term and getting on with these lovely quilts! 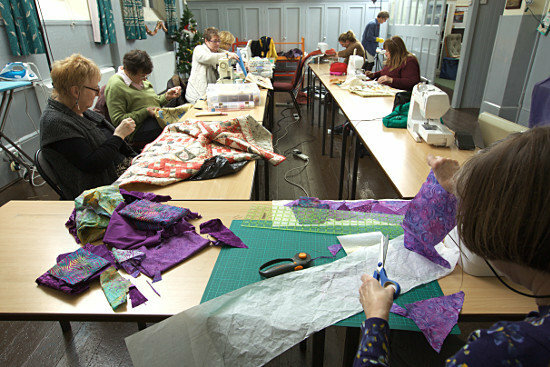 For anyone who suffers from SAD (Seasonal Affective Disorder) I prescribe joining a Patchwork and Quilting Course (or group) – it will get you out of the house, into good company and doing something exciting and creative! What better way of dealing with the winter blues? If you’re looking at the beautiful colours in your quilt, you aren’t aware of chilly grey days. I think a lot of qulters sew through late Autumn, Winter and early Spring, then become gardeners during the warmer months. Balance and symmetry! This entry was posted in Blog on 8 December, 2013 by admin. 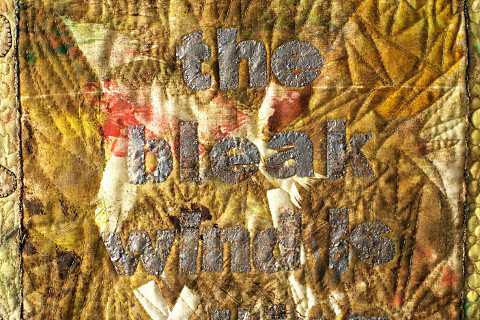 There will be a formal opening ceremony, with wine, at McLeans Art Gallery in Greenock,15 Kelly St, Greenock PA16 8JX. 01475 715624, and we are excited that the ‘celebrity’ officiating will be Baroness Liddell of Coatdyke, the most successful Scottish female politician ever, former Secretary of State for Scotland and former British High Commissioner to Australia. She just happens to be a neighbour of Jan’s (one of the Scottish group members). I think this is wonderful and I wish I could be there! If you’re anywhere near Greenock, go to the gallery and enjoy the work – comments from the Anglesey gallery were brilliant – our egos were well massaged! This entry was posted in Blog on 18 November, 2013 by admin. 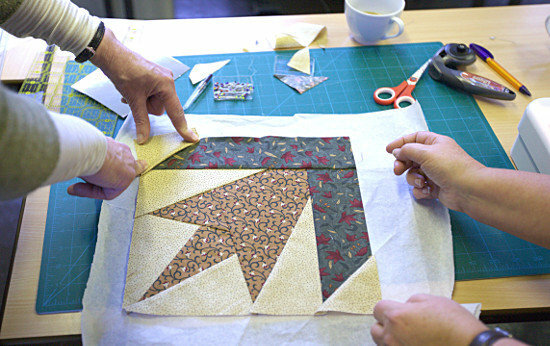 Last Thursday my Beginners’ group had got to Foundation Piecing – it’s a great technique which allows you to get precise, fine points without too much hassle. I really enjoy this technique and find it very useful. During the session I had twice mentioned Dodie, who had done both the Beginners’ and Intermediate Courses with me, when she walked into the hall. She had brought with her a beautiful textile hanging which she has been working on, based on the Alhambra Palace, Granada. Her work took the group by storm – they were very impressed, and rightly so, it is a stunning piece of work. Yesterday, I went to Llandegai Patchers meeting – I’m a member but am often unable to get to meetings. This time there was no way I could miss it: it was the AGM (and 21st birthday of the group) and the title of the talk was ‘Dorothy’s Girls’ with three of my past students, Elaine, Debbie and Dawn, showing and talking about their work. It can be a bit nerve-racking standing up in front of a large group and speaking, but they all did really well: the work was lovely and very much appreciated. Ann, sitting next to me in the audience, said: “You must be really proud of them” – of course I am! Now I need to rush off to my workroom to get on with the two wall hangings I’m working on for the next Cwilt Cymru travelling exhibition ‘Connection’ – they need to be finished by 1st December. This entry was posted in Blog on 13 November, 2013 by admin. ‘Come forth into the light of things, let nature be your teacher’. I gazed over Derwent water to Catbells and contemplated the lines of Wordsworth. An October weekend in Cumbria found me at Braithwaite village hall at the foot of Skiddaw, delivering a version of my ‘Butterfly Has two Wings’ talk for Region 15W of the Quilters’ Guild. The sun shone, picking out features in the landscape and making the beauty of the Lake District even more captivating. My talk, ‘The Butterfly has Two Wings’ is about me and my work, and is an ever changing thing – it has never been the same twice! I suspect I will have to adapt it to ‘…Three Wings’ soon, as my work evolves and wanders down new paths. I always enjoy visiting groups and meeting new people and we had a lovely welcome in Cumbria, meeting some very interesting quilters. After the talk we spent a little time in Keswick, a busy place even though it was well into October. 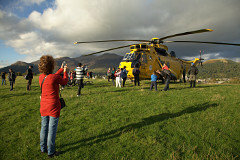 We wandered along the shores of Derwent Water – the beautiful lake which has Keswick nestling at its head and while we were there one of the RAF’s yellow Sea King rescue helicopters landed on a nearby grassy knoll, scattering sheep and drawing the attention of a little hoard of visitors. The crew had been involved in a mountain rescue and popped into The Theatre by the Lake for a cuppa before flying all the way back to their base at Leconfield, near Hull. Although we often see the helicopters from Valley flying past our kitchen window, this is the closest we have been to a wonderful Sea King. We’ll miss them when they go out of service. Back to quilting, a very special ‘thank you’ goes to Pat for looking after us so splendidly – we stayed in her lovely home in Threlkeld which she and her husband built in the footsteps of the arts and crafts movement. The care and attention to detail is wonderful to see. Pat, with members of the committee, entertained us to a lovely supper – we thought we’d be tired after a long day but in such good company we enjoyed a very convivial evening. On Sunday we headed for Penrith, to a wonderful shop in Penrith’s ‘Poets walk’ which is well worth ‘discovering’ if you’re in the area – ‘Just Sew’ – website: www.justsewpenrith.co.uk. Pat, who owns and runs Just Sew, was very welcoming and we soon settled into her very organised workshop and got down to ‘Machine Quilting’. The group worked hard and did very well – I suspect they all slept well that night. I hope they are all much more comfortable with the idea of machine quilting now – it seems to intimidate a lot of quilters, but there are ways of making it easier. We spent only a very short time in the Lakes but a very pleasant one. We’ll be back soon. Thank you to everyone for making us feel so very welcome. This entry was posted in Blog on 9 October, 2013 by admin. at Talgai Hall in Llandygai Village, nr Bangor, N Wales. Dates and times are on the calendar below. 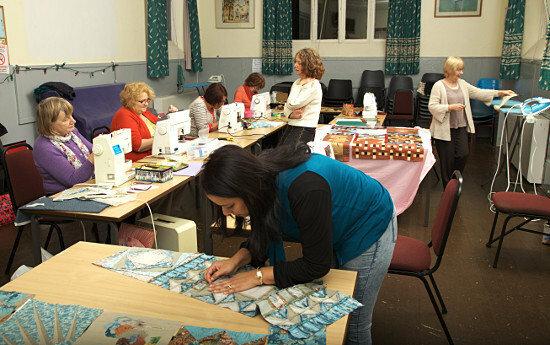 The course will run over eight sessions with strategically placed breaks to give sufficient preparaton time for the next stage, especially when we arrive at hand quilting. The image above shows just one of the possible blocks which form the quilt design everyone will be working on, but each finished piece will be very different once individual fabric/colour choice and block selection is taken into account. I love to see how much variety there can be on each course. I’m really looking forward to getting down to work and seeing the skills developing – with each new block bringing another system for piecing/layering/quilting and finishing. I look forward to meeting everyone on Thursday 17th. *Christmas break to make sure all the blocks, sashing and borders are ready. 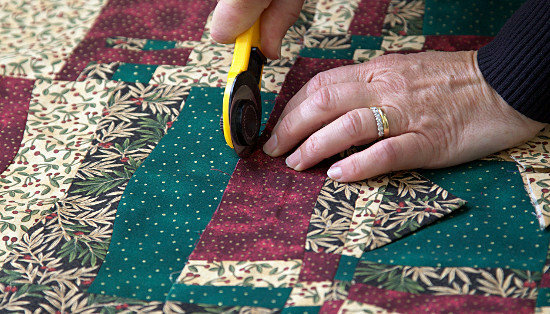 *Break to give time for hand quilting to be complete enough to bind/label and add hanger. This entry was posted in Blog on 8 October, 2013 by admin. It’s hard to believe how quickly the year is going: already the Intermediate/Advanced Course is well under way. It’s always lovely to see everyone again after the summer break. Lots has been happening over our summer – it was very busy, and not a break at all! First there was my exhibition, ‘Chocolates and Emotions’ at Ucheldre, in Holyhead; then the Region 13 quilt exhibition at Bangor Cathedral; finally we were very involved with the traveling exhibition ‘Spirit of the Celts‘ which came to Oriel Ynys Mon, where it opened on Saturday 3rd August and had its final day on Sunday 15th September. It got wonderful reviews and visitor comments. ‘Spirit’ is now in Scotland and will open at the McLean Art Gallery and Museum, Greenock (on the River Clyde) on St Andrew’s Day, Saturday 30th November. 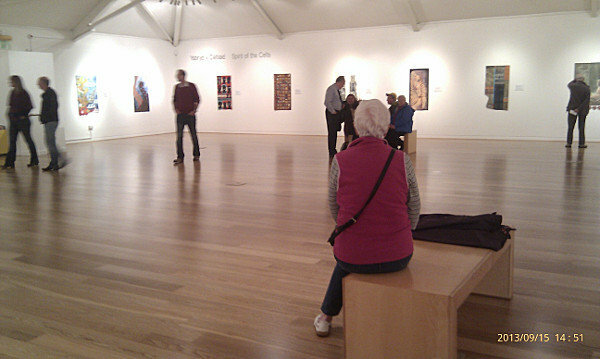 I hope the people of Scotland get as much from our exhibition as residents and visitors to Anglesey did. 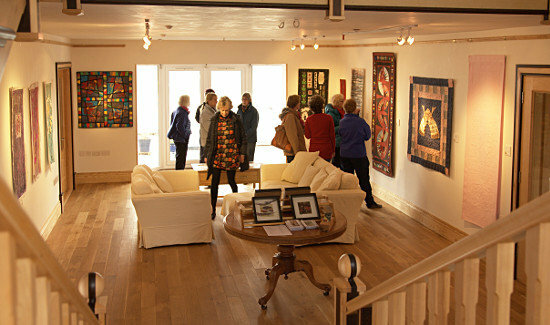 I spoke to some lovely people in the gallery and some of them made two, three or even four visits, which is wonderful! Great to see no age barrier! Thank you to everyone who came and a big thank you for all your lovely comments. The textile work in the exhibition was produced by 27 artists belonging to three different groups: Loose Threads from Northern Ireland, Turning Point from Scotland and last, but not least, the new kids on the block, Cwilt Cymru from Wales. Members of Cwilt Cymru are well spread across Wales, living in Cardiff in the south, Anglesey in the north, Aberystwyth in the west, Ruthin in the east, and several points in between. I’m the member who lives on Anglesey. Currently we are preparing work, with guest artists, for our next touring exhibition which has the theme ‘Connection’. I’m also working towards a one-woman-show at Oriel Ynys Mon (the Anglesey Gallery) in 2015 and there don’t seem to be enough hours in the day to get everything done. It’s good to have a deadline. I’m really enjoying experimenting with new approaches to my work. This weekend, 5th and 6th October, I’ll be giving a talk and workshop to Region 15W of the Quilters’ Guild in Cumbria: the talk is ‘The Butterfly has Two Wings’ (I know they have four!) and I’ll be teaching Free Machine Quilting in the workshop. 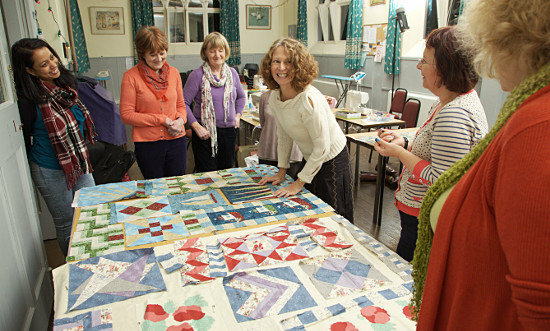 I’m really looking forward to it – I love meeting people, especially quilters, and it’s ages since I was in the Lake District – always a treat! This entry was posted in Blog on 3 October, 2013 by admin. Spirit of the Celts Exhibition. 3rd August to 15th September at Oriel Ynys Mon, Llangefni. These three textile groups have taken the folklore and history of the Celtic lands as their inspiration. 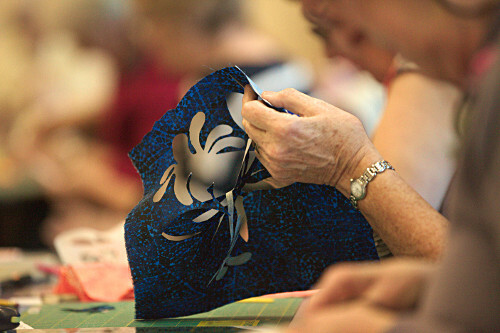 They celebrate their quilting traditions with fabrics such as cotton, silk, or wool, but also explore new media such as paper, metal, plastic or paint. 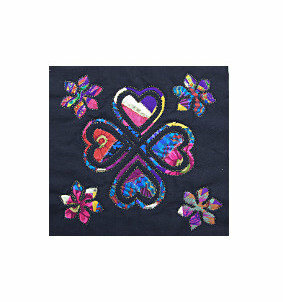 Stitching by machine or hand may be accompanied by beading, burning, and drawing. This is quilting as an exciting contemporary art form. We would love to see you at the exhibition opening on Saturday 3rd August, 12 noon to 2pm where you will be able to meet one of the artists, Dorothy Russell, a member of Cwilt Cymru. There’s plenty of parking and a very good cafe. This entry was posted in Blog on 30 July, 2013 by admin. 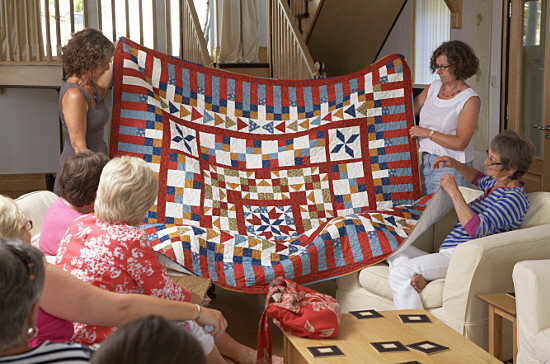 On Sunday 14th July I had a coffee morning with all of the members of my quilt groups who could make it. I had a wonderful morning and from the feedback I have received in emails and comments, I wasn’t alone. It’s great to be able to relax together and enjoy each others’ company without the pressure of deadlines for work to be done. Now that Daf and I have gone gluten free, I have taken a new look at baking. On the internet I chose three recipes to try: Carrot Cake, Lemon Drizzle Cake and Pear and Chocolate Cake: they all feature ground almonds and eggs, with no flour, although one has mashed potato in place of it! They were easy to make, and to eat – I think, on balance my favourite was the Pear and Chocolate Cake which I made with 90% Lindt! I cut the cakes into small slices to encourage everyone to try all three without embarassment – you know how sensitive we women are about being seen tucking into huge wedges of cake, let alone coming back for more! Luckily, there are no photos of any of us eating – much kinder that way. But there are images of our ‘show and tell’.It’s always wonderful to see what everyone has made and even though I see everyone in one group or another, I can still see new or unknown work. We don’t only produce textile work either – Anneli, one of the younger generation of quilters produces beautiful work both in textiles and wood, but I think her next production will be her best yet. Anneli’s baby was due to be born on the very day of the coffee morning but she made it to the end without going intcident. There were plenty of volunteers to hold her hand and we even had a midwife, Rachel, on hand, but her skills were not required. It would have brought a different meaning to ‘show and tell’ though, wouldn’t it! 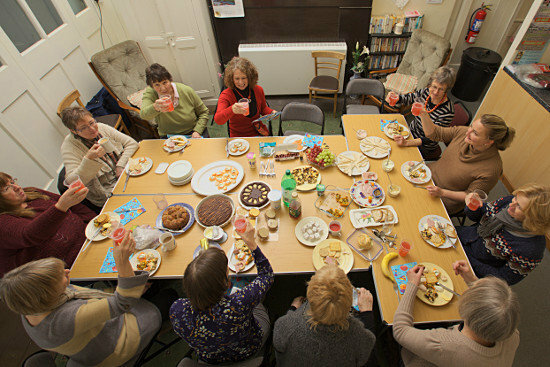 I musn’t be too long arranging another coffee morning, quite a lot of people couldn’t come to this one and we all love informal ‘get togethers’ – and an excuse to find new cake recipes. Perhaps we’ll have our youngest ever member at the next one. This entry was posted in Blog on 22 July, 2013 by admin. For three days this week I have had company in my workroom. Eileen, her husband, Lee and their son Eoin (or Eoghan – pronounced like Owen) stayed in our holiday cottage here at Coed y Berclas. 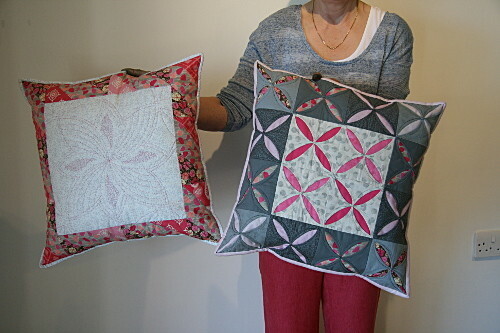 As a birthday present from Lee, Eileen had three days of patchwork and quilting tuition with me. She had selected ‘Magic Tile’ which is fairly complex and requires a number of different techniques – a very good choice, because over the three days we covered – fabric use for her fuscia design, ‘bondawebbing’, cutting to design lines, re-assembling using joining strips, machine quilting ‘in the ditch’ and applique stitch (a blanket stitch on the machine). Eileen will finish quilting, beading and binding her hanging in her own time and has promised to send me an image of the finished quilt which will appear in a subsequent blog. It was a delight working with her while her husband and son discovered some of the pleasant ways to pass the time on Anglesey and North Wales. They had fun too. This entry was posted in Blog on 7 July, 2013 by admin. I had been intent on making a piece of work for the ‘Horizons’ exhibition at the NEC but getting everything ready for my own exhibition ‘Emotions and Chocolates’ at Ucheldre Holyhead took priority as I watched the deadline getting closer and closer. Once my Ucheldre exhibition opened, I mentioned ‘Horizons’ to Daf… he said “just do it” – so I started – with just four days to the deadline! Well, it took three days – and I got to eat and sleep. The name of the hanging – ‘I Must Remain Calm’! This entry was posted in Blog on 29 June, 2013 by admin. Many thanks to Lin Arnold for these two photos. 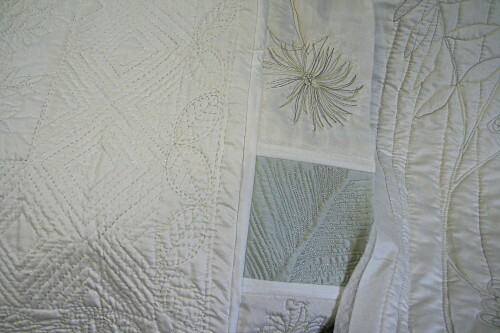 I’d love to see more images of some quilted and finished pieces. It’s a long drive from Anglesey to Romsey but you made it all worthwhile. We were struck by the lovely architecture which has been retained and looked after in Romsey and particularly enjoyed our walk round the Abbey – which is not only special architecturally but also contains some beautifully worked textiles, including the altar cloth which, we found out, was one of a set made by a founder member of Romsey Quilters. We also managed a short drive in the New Forest, which we thoroughly enjoyed – we especially loved a newly re-thatched roof which looked just perfect and some stunning pargetting. It all added to the joy of our visit. A long drive home, but we made it, safe and sound, if a little tired. This Thursday, at 6:00pm is the opening of my exhibition ‘Emotions and Chocolates’ at Canolfan Ucheldre, Holyhead, so if you’re in the area, please come along. 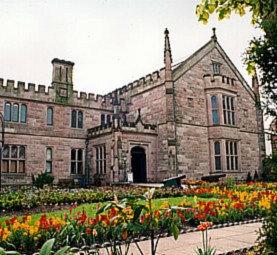 The exhibition runs from Friday 21st June – Wednesday 17th July and the Centre is open every day. It’s a great venue and there’s always something going on there, including live stage performances of drama and music; films, exhibitions and recently they started showing ‘live from’ operas and ballets – these are proving very popular around the country. I hope that even if you can’t get to the opening of my exhibition, you’ll be able to see it before the 17th July. This entry was posted in Blog on 18 June, 2013 by admin. Free-cut curves workshop. May 2013. Yesterday I taught Free-cut Curves to a slightly disorientated group – they thought I had thrown away the rule book. I’m usually very fussy about safety and the correct use of rotary cutters. I’m prone to hissing ‘blade!’ at poor unsuspecting quilters who wave about or put down bare bladed cutters – with good reason, they are potentially very dangerous. However to do free-cut curves, you don’t use a ruler, just the cutter and mat. It tends to raise everyone’s caution levels but it gives some very interesting results. 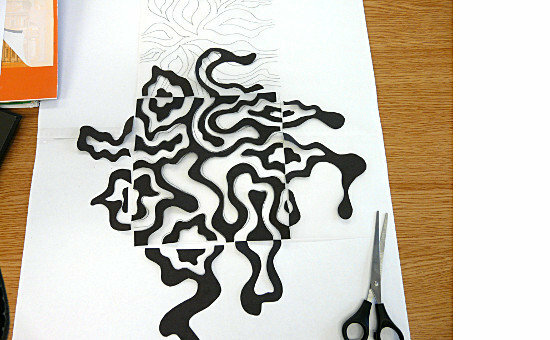 I feel tempted to say ‘Don’t try this at home’ but I’ll resist and say try it by all means but be very careful – I think the best approach would be to remember when you were a child doing lino printing and you were told never to cut towards your fingers. The same approach applies to free-cut curves. Most adults are used to using sharp knives in the kitchen, so give it a go! The curves can’t be too tight or they’d become very difficult to stitch together. You don’t actually need pins to line up the seams but I do still advise using a quarter inch foot when sewing them. You can’t get the same results from a conventional approach, so perhaps the group were right – we had thrown at least some of the rule book away. 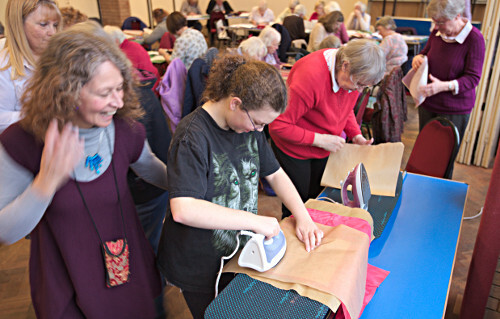 When I looked at everyone elses fabrics, I thought they were all much more interesting than the ones I had brought for demonstrating – how many times has that been heard at a workshop! A few people brought work from earlier workshops or completed work from one of the courses. A week ago I taught ‘Fabric Dyeing’ which was agreed by everyone to be great fun, and some of the results very exciting – it probably helps that you have to wait at least three hours (I usually leave them overnight) before you can see the results of your experiments. 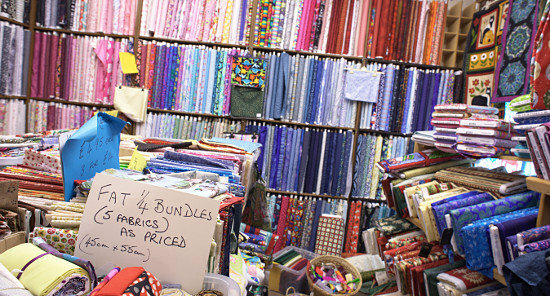 It’s like Christmas Day for quilters, but instead of presents we open surprise packages of multicoloured fabrics and enjoy the patterns and colours which have formed. Margaret Harrison and Marion Gash brought their dyed pieces for us to see and they both had lovely fabrics which could be cut up and used or layered and quilted as wholecloth. 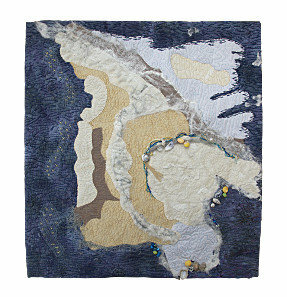 As part of the same project, Ann Davies, influenced by the work of a local artist, used a photograph she had taken of the foamy ripples of a wave on an Anglesey beach as the starting point from which she built this textile piece. She used a fascinating little hand drill to put the stitching holes in the shells and employed a lot of techniques, which were new to her, to very good effect. This entry was posted in Blog on 31 May, 2013 by admin. 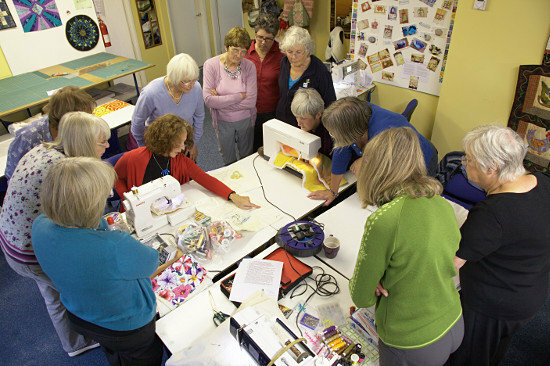 Canadian Quilters at Coed y Berclas. 19th May 2013. I’ve just had another really lovely day. 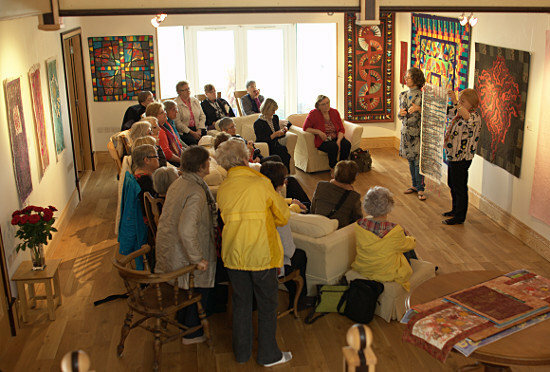 Liz and Peter Cox of Quilters Travel brought a group of absolutely delightful Canadian quilters to Coed y Berclas to see my work. They were on a fairly tight schedule: they arrived at 09:45, took in the amazing view from our house, my talk lasted an hour (10:00 – 11:00, very tightly controlled!) 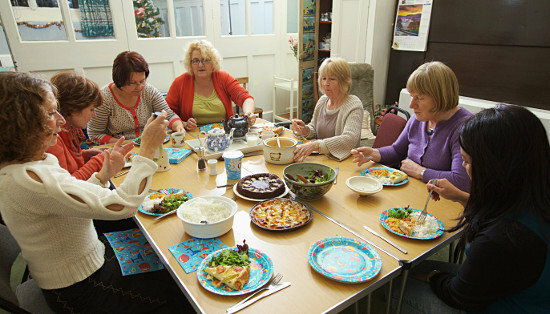 then we had coffee/tea and homemade Welsh cakes while we chatted about the quilts. At 11:45 (precisely!) they drove away in their coach for lunch at The Bull in Beaumaris. It felt like a bit of a whirlwind visit but I truly enjoyed every minute – they were so interested and so very pleasant to spend time with. I’d love to be invited over to Canada to do some workshops. After a very brief lunch I whizzed off to the dress rehearsal for the dance show I’ll be appearing in (very briefly!) next Saturday, at Venue Cymru in Llandudno. There’s a fair bit of waiting around at a dress rehearsal, but in the best of company!!! Roll on the show!! We’re Rubic’s Cubes …………….! This entry was posted in Blog on 19 May, 2013 by admin. Reverse Applique Workshop. 16th May 2013. I had a really lovely day teaching Reverse Applique today. I saw lots of people I hadn’t seen for weeks – I hadn’t realised how much I’d missed them until they started arriving. We’ve got to have a get-together soon; a coffee morning or something similar, where we aren’t working on anything more serious than relaxing together. The atmosphere in the room was great – a blend of ‘busy-busy’ and Liz’s amazingly ‘mucky’ laugh: I could do with her in every workshop to keep the group smiling. 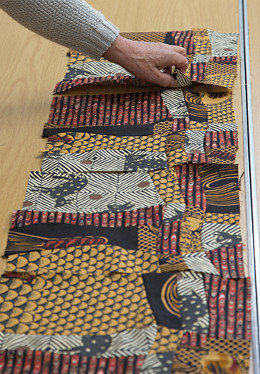 Everyone brought an individual approach to her work and, as this session is really about learning a new technique, I look forward to see how everyone applies it to future textile pieces. The results were really good and I have it on good authority that everyone enjoyed the workshop – they told me so! Next week it’s Fabric Dyeing which is always fun and great to see the results. Like Reverse Applique, there are always unexpected outcomes – part of the enjoyment is in the ‘serendipity’ effect. I had a phone call from Roy at the Anderson Gallery to say he has finished framing the small quilts for my exhibition at Ucheldre, which opens at the end of June, so now I can relax a bit and look forward to that! This entry was posted in Blog on 18 May, 2013 by admin. 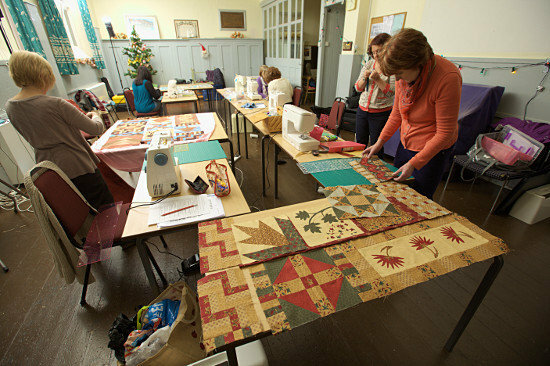 Wholecloth and Machine Quilting are now completed – both busy workshops. I look forward to seeing some of the completed wholecloth quilts when they’re finished: the designs, drawn out on fabric and partly quilted, already look really good and once the magic of stitch brings them to life, I know they’ll more than live up to that promise. 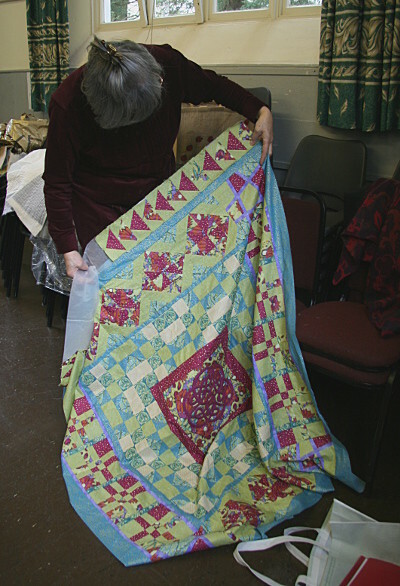 Machine Quilting is more about learning a technique, which can then be practised and practised and applied wherever it’s required. 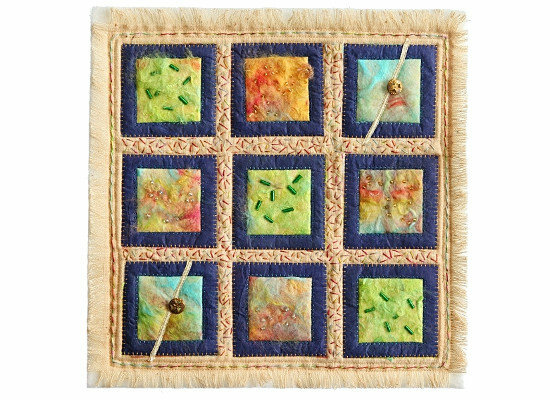 I love the fact that people leave the class more relaxed and confident with the though of using this technique in their quilts. Next Thursday I’ll be teaching Reverse Applique (link the words ‘reverse applique’ to the it’s page in the ‘workshops section) which is a great technique with an element of surprise in it every time: I’m looking forward to seeing the results. This entry was posted in Blog on 13 May, 2013 by admin. 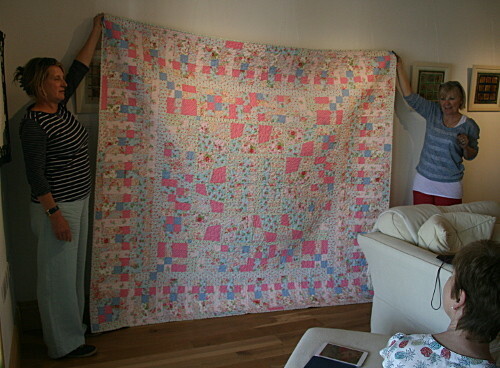 I recently handed over the ‘Breila’ quilt to its new owner, Sharon. Breila means rose in old Welsh and the quilt is based on the historical character Siwan (Joan/Joanna), daughter of King John, who was married to Llewelyn ap Iorwerth (Llewelyn the Great), Prince of Gwynedd. They lived in various courts around their principality, travelling from one to another. When Siwan died, Llewelyn founded a friary in Llanfaes, near Beaumaris, to her memory; she was buried there, but now her sarcophagus is in the porch of St Mary’s Church in Beaumaris. Llewelyn’s name for Siwan is believed to have been Breila. Sharon is very happy with her quilt. 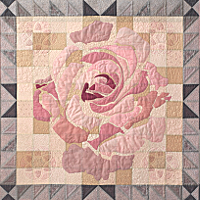 Click here to see the Breila quilt in my portfolio. This entry was posted in Blog and tagged Contemporary on 1 May, 2013 by admin. I didn’t really know what to expect from Anglesey Open Studios but I really enjoyed being involved. I met some lovely people and got very positive responses to my work. I would really encourage anyone contemplating joining an Open Studio organisation to do it. I had 88 visitors and I wasn’t open every day. The time vanished. This entry was posted in Blog on 8 April, 2013 by admin. 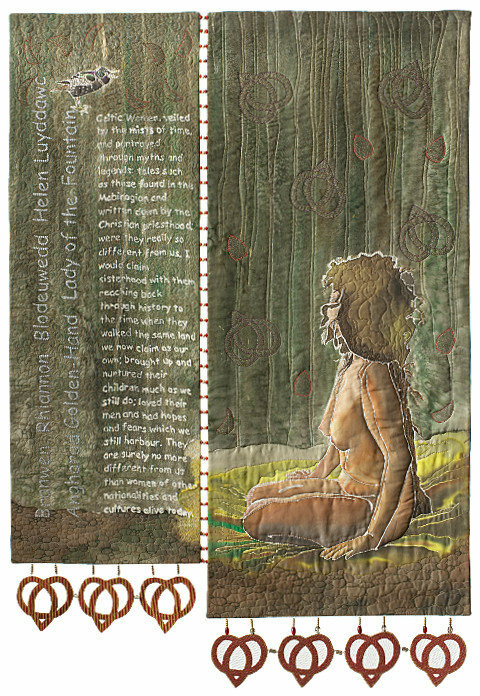 During Open Studios and Galleries Week, artists working in a variety of media – including Quilts! – open their studios to visitors. You have the chance to meet with the artists and gain a unique glimpse of the artistic process. Coed y Berclas, Allt Bryn Mel, Llandegfan. LL59 5PF. mob 07941 102185. Beaumaris end of Llandegfan. Look for the Open Studios sign on the gate entrance to the old Bryn Mel Manor Nursing Home Please bring slippers or be prepared to take your shoes off in the house! This entry was posted in Blog on 24 March, 2013 by admin. 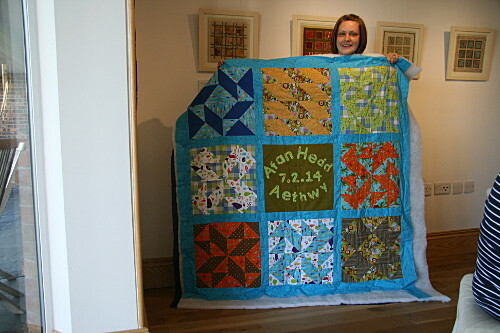 I have just had a very enjoyable weekend in Northern Ireland as a guest of the Northern Ireland Patchwork Guild. I was made to feel very welcome and Anne, my hostess looked after me very well and was great company. She took me for a drive round beautiful Strangford Lough – I can’t believe I didn’t take any photos, but I did do a lot of gazing! The group is large and very vibrant, so it was great giving a talk to them – the interest and feed-back were brilliant – thank you everyone! 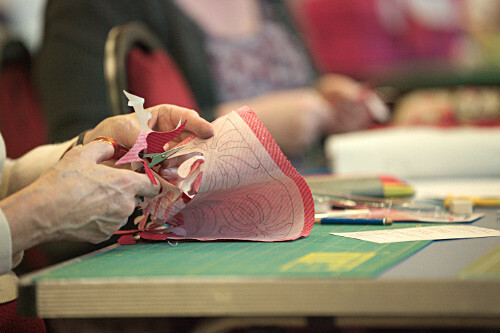 They also have a high level of skills which became evident in the Free-cut Curves workshop – they work hard too. 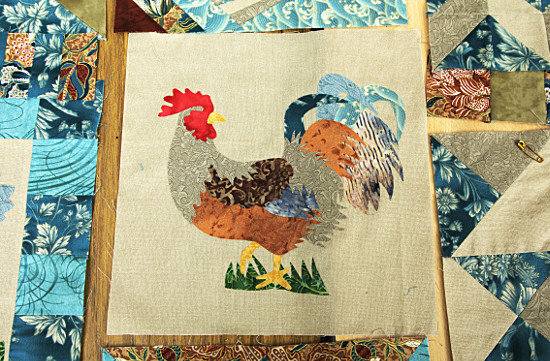 I wonder if anyone has finished their quilts yet – I’d love to see photos. This entry was posted in Blog on 9 March, 2013 by admin. The titles, dates, times and prices of this year’s Individual Workshops are now listed on the Workshops Courses and Talks page of my website. You don’t need to have any previous experience of patchwork/quilting to do some of the workshops, so if you would like to try something new but are not sure what would suit you, take a look at the list, then give me a call. This entry was posted in Blog on 8 March, 2013 by admin. 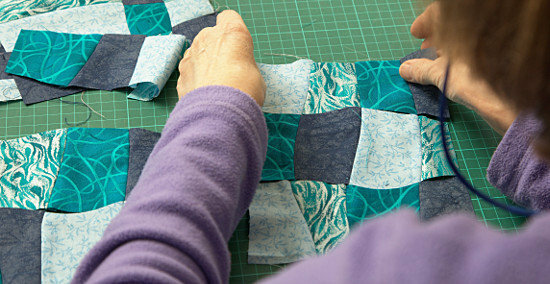 Another new year and there’s a lot to fit in – masses of quilting ideas to resolve and have fun with. I have joined the Anglesey Open Studios this year, so please come along, meet me and see some of my work. Then, in June, I have an exhibition at Ucheldre – more anon! I have so many ideas, I don’t know how I’ll find time to bring them all to fruition, but, believe me, I’ll try. Next Thursday, I’ll see my Beginners again, and hopefully they will have their quilt tops assembled, so it’ll be exciting for us all to see how they all look. The following week, it will be the turn of my Intermediate group to start assembling, quilting and embellishing their Art Quilts — they’re already looking amazing. It is an awfully long time since I wrote a blog and I’m (justifiably) in trouble with Wendy. Sorry!!! This has been a very busy year, with so much going on: Our joint Welsh/Scottish/Northern Irish exhibition, ‘Spirit of the Celts’ has now made its way to Wales and has completed its time in the south. 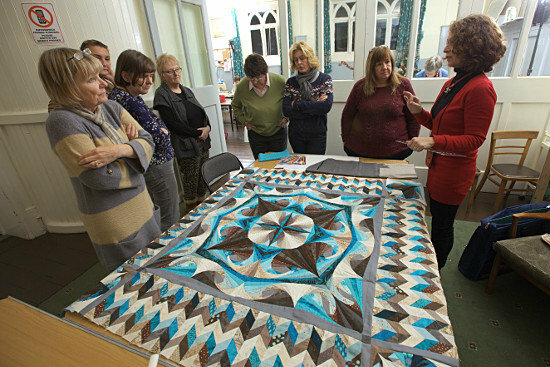 In February, the work by Welsh group, Cwilt Cymru, will make an appearance at Quiltfest, Llangollen before the whole exhibition is on show at Oriel Ynys Mon, it’s final destination, from the 3rd August to 15th September 2013. My Intermediate students have worked really hard since September: they have been studying the work of a chosen artist, learned various new painting and printing techniques and applied both ‘strings’ to developing their own ideas in quilt art. They have produced some fantastic work and even though they have been well outside their ‘comfort zone’ they have been amazing and I’m very proud of the results. When we’re back together in January, it’ll be time to look at presentation, embellishment and finish. The Beginner quilts are now at the ‘completed top’ stage, so we’ll be layering and beginning to quilt them in the New Year. The quilts, even though they follow the same layout and specific skills are totally individual and I can’t wait to see them quilted and bound. I have designed the new quilt for the Beginners Course which starts this September, but no pics it’s a secret until I show my students! Amanda, an American post graduate student of Theatre Design, currently based in Edinburgh, came to stay with us to do workshops in patchwork/quilting. Apart from a rapid visit to Beaumaris castle to a special Medieval event, Amanda hardly had time to breathe. In one to one sessions we managed to get through four workshops in two days – this is not to be recommended but she had come a long way and I wanted to make her journey worthwhile! I hope the work she did with me will be of use to her in her project. On Thursday 26th I went to a Region 13 CQ meeting, a workshop in the use of stabilizer, specifically for 3D, taken by Kristina Hughes. I can’t usually get to these meetings which are held every two months on Thursdays – I teach on Thursdays! This session, however fell in my summer break, so, for once, I could get there. 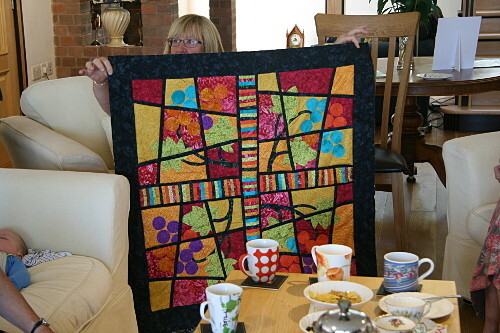 It was good to get together with other contemporary quilters – refreshment for a teacher being taught! Thanks Kristina. From the Workshop I taught to Hutton Priory Patchers I love to see the results of work inspired by something I have taught. Christine, a member of Hutton Priory Patchers, sent me these photographs of Notan ideas with which she has experimented since the workshop at Worden Park. I love the circle and the triangle – they’re stepping away from the system we started off with. Gill, from Staffordshire, won a workshop with me in a competition run by Craftseller Magazine..
Gill chose to come on two Sundays in May to learn how to make a Magic Tile quilt top. Although she had previously done a lot of sewing, this was her first venture into patchwork and quilting and she threw herself in at the deep end, learning lots of new techniques She was in good company, for, although most of the group was made up of members of my Beginner and Intermediate courses, Evie, from Mid-Wales, also new to patchwork and quilting, was a member of the class. She had been bought the workshop, as a birthday present, by her mother.